The polls are not looking good for Donald Trump. Indeed, I suspect my most recent prediction for the 2016 race gives him too many states. With time running out, he now faces pressure to come up with some new idea or a new narrative to change the likely outcome. Which may explain why he just unveiled a new plan to “drain the swamp” in Washington with new ethics rules. Such initiatives tend to be popular with voters, who view Washington as a corrupt mess. And an ethics-reform agenda may be an effective way of reminding voters that Hillary Clinton has major problems with corruption. But let’s consider whether his plan actually would work. Taken directly from his campaign website, here’s what Trump is proposing. As you can see, he basically wants to make it harder for Washington insiders to go through the revolving door. And to augment his lobbying restrictions, Trump also has embraced congressional term limits. 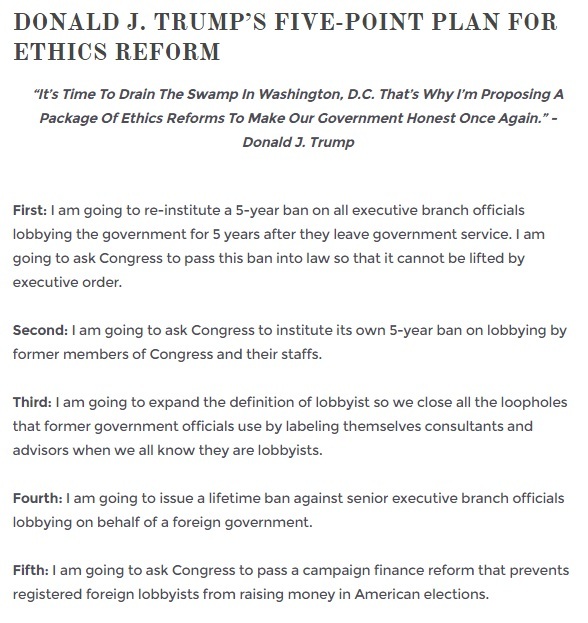 Donald Trump added a new proposal to his recently unveiled ethics reforms package on Tuesday, promising to pursue a constitutional amendment that would impose term limits on members of Congress should he win the election on Nov. 8. …Establishing term limits at the federal level would help “break the cycle of corruption” that has plagued Washington and “give new voices to change so that we can have a government that works again and can function properly,” Trump argued. For what it’s worth, I suspect many voters will like what Trump is saying. For people in the political world, the obvious follow-up issue is whether a popular issue/agenda actually will attract voters. In other words, will people concerned about Washington corruption rally to Trump simply because he highlights the issue. I’m much more concerned with a different follow-up issue, which is whether his five points (six if you include term limits) would actually work if they were adopted. To be blunt, I’m not holding my breath. And the reason for my concern is that Trump isn’t proposing to actually drain the swamp. There’s rampant sleaze in Washington because politicians and bureaucrats have massive powers to give undeserved wealth to those with political connections. In other words, the “swamp” is big government. And since Trump isn’t proposing to shrink the size and scope of Washington, the incentives that currently exist to get unearned wealth via government coercion will still remain. 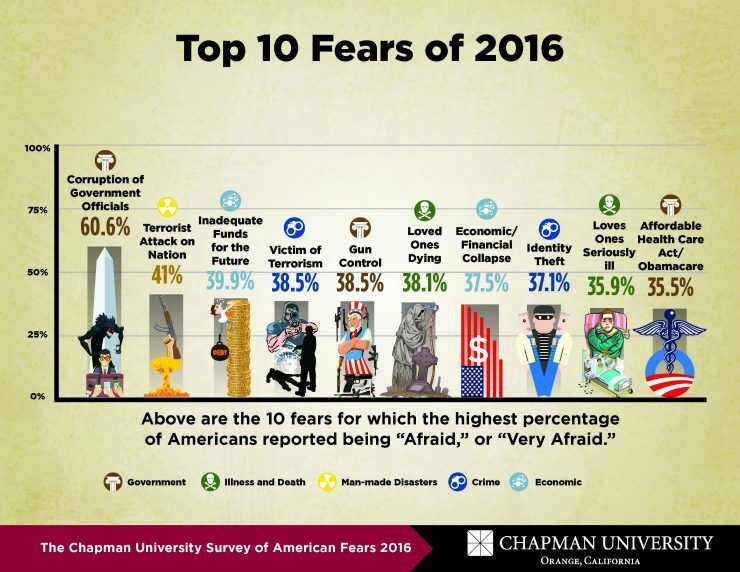 If you look at Trump’s proposals, what he’s really talking about is a plan to make it somewhat more difficult for certain people to wade into the swamp. I have no objection, by the way, to additional rules that hinder the ability of politicians, congressional staffers, and presidential appointees to cash in on the connections they’ve made. But I’m also not naive enough to think that this will reduce Washington sleaze. The policies that Trump is proposing are like pressing down on one part of a balloon and somehow hoping that other parts of the balloon won’t expand. Indeed, that’s the message of my video on the very strong link between the size of government and the amount of corruption. P.S. Let me add a technical point that is very important in this discussion. Lobbying occurs when someone asks a politician to vote “yes” or “no” on a piece of legislation. It’s not lobbying, however when someone tells a politicians that an idea is good or bad (which is what I often do as part of my job). But if Trump can change the definition of lobbying for former government officials (the third point in his five-point plan), that might disrupt the status quo for certain people (assuming it could be effectively enforced). But so long as the size and scope of government isn’t curtailed, that kind of change won’t eliminate the incentive of interest groups to hire people who are allowed to lobby. The only way to reduce corruption is to reduce government. P.P.S. By the way, restrictions on campaign donations also won’t work. Because the important thing is to do something, whether or not it will work.